A couple of months ago I was one of the people who volunteered to test Mrs. Moen's Magic Star online class. I completed the class and gave her my feedback. These five star blocks were the end result of the class. Since I was busy with other things, they just sat in my cupboard on the shelf along with some of my other UFOs. 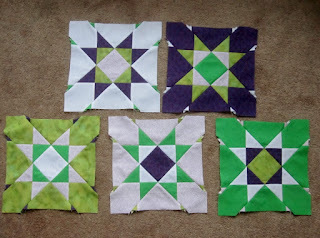 A couple of weeks ago I was reading Alida's blog and she mentioned wanting to make some charity quilts "to help the kids in the DC General Homeless Shelter" and requesting readers' help by "donating orphan blocks, partial blocks, or fabric (scraps, strips, leftover, uglies, whatever)." Well, since I too make charity quilts I started thinking about how I could help out. I remembered these five blocks - in essence, orphan blocks, and so I emailed Alida and got her address. I'm happy to report they arrived safely and she has a plan for these. Out of my house and being of some use. A win-win for everyone. I'm working on a pirate outfit for little Luc for Hallowe'en. The pants are done and the shirt is almost finished. Then there's just the belt to make. I've been slow with the sewing because I've been helping out with looking after my baby grandchildren. Hilarious, adorable and oh so cuddly. How kind of you to share. They look lovely, but so far my attempts at quilting have been a bit disastrous. I'm too impatient I think. A win-win situation like this is the best! Those are nice blocks, and it's nice that you, Alida and whoeveer gets the quilt they are sewn into benefit. My very first mystery qal when I began blogging/quilting was with Mrs. Moen. She is very creative. Those blocks are just lovely, what a nice thing for you to do! Don't forget to take pics of the pirate costume, I can't wait to see that! I think, that to be a quilter, you must be a mathematical genius. One who must never make mistakes, I tried a few times but failed , hopeless! The grand babies certainly admire you I am sure, hope that some of your talent rubs off on them. They will be grateful.